autumncrush, originally uploaded by AmyMarieWillis. houseboat, originally uploaded by AmyMarieWillis. I recently had a little bug and with being so achy, all I could think about was living in my claw foot bathtub. I hope you all had a great Halloween. Mine was perfect! I met some amazing people from the area and a few new connections from Portland. 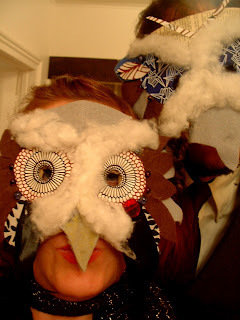 I made owl masks for my friend Casey and I, since the event I was going to was in a barn. Seemed appropriate. Only a buck 49 spent on costume supplies! It's cold. Really cold, November doesn't mess around! So far I have stayed far away from any cold, flu, sinus infection and I am thrilled. (knocking on wood as we speak) It's full moon time again, and the weather is going to be Winterized before we know it. It's dark so early and it makes me want to sleep at 8:30PM! Ahhh well, it is what it is. I haven't been working on too much. I have another bird vs jellyfish piece drawing in the works, but I am taking a little hibernation break. I had guests for 2 weeks, and I loved every minute of it, but, I need some Amy time. So far that's included lots of warm beverages, cuddling up in blankets with the dog and movies, movies and more movies. Keep warm and take your vitamins. And seriously, if you are sick, stay home!